DEJECTED: ''Derry City manager Peter Hutton makes his way off the pitch at the final whistle. 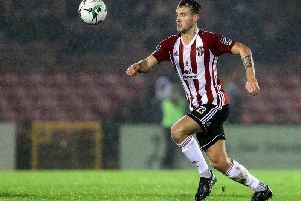 DERRY City were booed off the Brandywell pitch at the final whistle as a heavily depleted Galway United came away with a well deserved victory on a disastrous night for the Candy Stripes. Despite an encouraging opening to the game from City, two goals in the space of five first half minutes gave Galway a comfortable lead and they held onto it without much of a fight for the remainder of the match. It was certainly a night to forget for Peter Hutton who watched goalkeepers, Gerard Doherty and his replacement Shaun Patton come off the park injured. Tommy Dunne might have been minus NINE first team regulars for the match but they were good value for the three points and it could have been worse for the ‘Candy Stripes had it not been for a brave save from stand-in goalkeeper, Anthony Elding in the closing stages who saved from Padraic Cunningham who was sent clean through on goal. Derry had made a bright start to the game and Morrison’s close range strike was cleared off the line by Cormac Rafferty in the opening minute. But it quickly went downhill for the home lot from there as Connolly came close to putting his side into the lead on eight minutes but screwed his shot wide of the near post. The Brandywell crowd rose to their feet on 18 minutes to applaud City legend and club top goalscorer, Mark Farren who was present in the stand - the Greencastle lad currently battling against a life threatening brain tumour. There was little for the home support to cheer about after that, however, Galway netting twice in the space of five minutes to silence the attendance. Connolly’s corner was flapped into the path of Cunningham by Doherty who drove his shot into the net on 23 minutes. Galway added a second five minutes later when Connolly’s clever diagonal free-kick was headed into the corner of the net by the unmarked Keegan. Derry were shell-shocked and Connolly’s corner kick almost caught Doherty out at the near post but crashed onto the crossbar before going behind. Galway boss, Dunne was furious with the match officials for failing to award a penalty kick just before the break after Ryan McBride dived in to tackle Enda Curran. It was much improved from Derry on the restart and a jinking run from Morrison allowed McNamee space to bear down on goal but he sent his shot just wide. The night was to get worse for City as substitute keeper, Patton was stretchered off after colliding with Gary Shanahan. Elding took the goalkeeper jersey and he was immediately called into action when Keegan tried his luck from distance but the Englishman saved with his feet. And Elding came to his side’s rescue once again with nine minutes remaining as he did superbly to save Cunningham’s shot in a one-on-one situation. Morrison came close with a downward header from six yards one minute later but Gleeson saved comfortably as Galway deservedly secured maximum points. Derry City: G. Doherty (S. Patton 35, R. Curran 73); S. Kelly, R. McBride, S. McEleney, A. Barry; J. Daniels (R. Curtis, 58), P. Lowry, B. McNamee, M. Timlin; A. Elding, C. Morrison; Subs Not Used - D Jarvis, S. Clucas, N. Boyle, S. Houston. Galway United: C. Gleeson; C. Raftery, S. Walsh, P. Sinnott, C. Horgan; G. Shanahan (A. O’Laoi 73), R Connolly, D. O’Leary, J. Keegan; P. Cunningham, E. Curran; Subs Not Used - K. Cantwell, A. McDonagh, K. Garcia, S. Oji, C. Winn.